I can be quite negative at times, it´s in my character. But I´m an optimist at heart so it´s never for very long, unless there are extenuating circumstances. Like now, for example. What a hole this part of the world is. I should have left it in those books I used to read. Why did I have to try to replicate some of the experiences of those men, who journeyed here all those years ago? They were better men than I. They must have been to have coped with this. We haven´t been able to see for more than a few miles for almost 3 weeks, even in the hills. The sun is like a feeble, energy-saving bulb until 10am and after 4pm. Everything and everywhere is the colour of dust. It´s underfoot and foot deep, like walking through flour. It´s in and on everything. You don´t realise how thick it is in the air until you switch a torch on at night. And just as thick around us are the local authorities. We are feted by some then hounded and impounded by the next. Even in small rural communities there are flash cameras mounted on gantries above the road. We escape notice only until our second night. The local populace stands in gangs about us in every village and town, not unfriendly but not welcoming either, simply non-plussed. One or two will invariably call the police as if it´s all they know to do. Not more than one in several hundred will venture a ´hello´ until we do; they are content to stare silently, or snigger nervously. And even in those serene moments when we are miles from anybody we seem to fight more over a single choice of route than we have done in four years of marriage. Then when we have to make it to a big town with a hotel we must show a marriage certificate to the dismissive A-hole at the front desk to have even a twin room together. 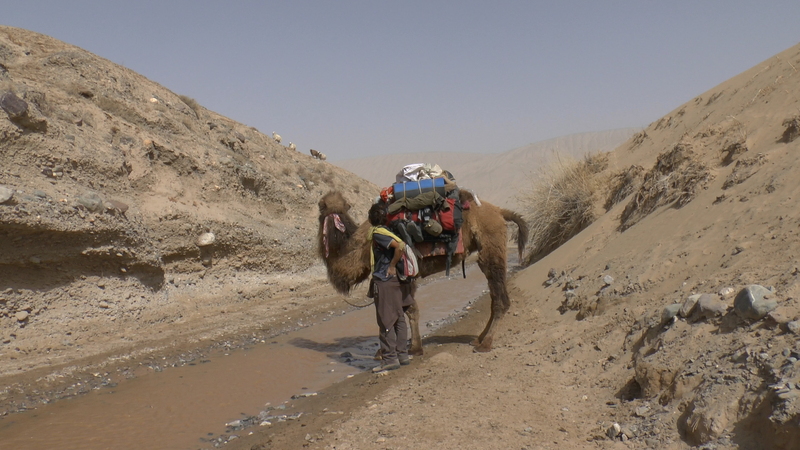 Unless you relish hard travel just for the sake of it I will unhesitatingly recommend anywhere else in the world to go to – except Chad which I´ve heard is horrendous – rather than the modern day incarnation of the southern Silk Road. And yet these two days we have been fighting to have more time here. It´s visa extension time and we are in Khotan to try our luck. At moments, my resolve wobbling, I have wondered why we should persevere? Physical barriers are one of the attractions of an expedition; human barriers are no fun at all. Then I remember what we are trying to do and that it´s difficult simply because it´s not done. Every day brings the unexpected so we must live on our wits and that was what we were after from then start. We are achieving something unique and the experience is only lacking the visual feast that normally serves to counter-balance the discomforts of such a venture, and a more complete freedom to do what we want. And regarding the latter it seems things may henceforth get better. We are now fully visible to the police but have found a sympathetic, high-ranking Han Chinese officer who speaks English and likes us to call him Jackson. He wasn´t at first sympathetic when we walked from the mountains into his prefecture and had us held in Khalia police station for a night. Upon meeting him the next day, however, he proved a little more malleable. Not entirely so, however, for whilst not closing us down completely as at first was threatened he ordered us to change our route and not stray far from the larger towns and oasises further north. “It´s for your own safety.” He intoned, glancing wistfully and for the hundredth time at the dust on his previously impeccable city shoes. We had to break the trip around now to get our visa extension in Khotan in any case so were happy to comply for a while, show willing to relax his gaze, but then he had us tailed to the extent that we must have appeared as criminals to the local populace. After two long and dusty days marching into a strong wind, back out of the hills and into the desert we then found that all our attempts to find someone to look after our camel for a few days were scuppered by the immediate arrival of up to ten vacant looking officers all chewing sunflower seeds and doing little else but gawp. We called Jackson repeatedly to complain and finally persuaded him to drive his precious new 4×4 out of his urban comfort zone in Pishan for a second meeting, 40kms to his south in a town called Koshtaga. There, in a pavement eatery, with the light blotted out by half the town´s menfolk gathered around we fought for our trip as I tucked into a local speciality called Soghman which has poisoned me for four days now. We flatly refused to travel on the roads and were theatrically surprised he could even think of putting us in so much danger. On his map we pinpointed the villages we wanted to visit, each chosen only for it´s being at the top of a valley. “But there are no roads between these!” He whined. “It´s too dangerous!” “Of course there are roads, just not asphalt ones.” We could now respond confidently after feeling our way for four days and over four passes between the villages of Usheke-Pech and Khalia, guided only by shepherds helping us to scratch impromptu maps into the ground. “How do you think people used to get between these places before motorbikes came along and made it easier to go around?” He looked to the local police chief on my left for support but when our English was translated into Uighur there was a murmur of approval around the crowd. The older ones knew there were routes there: yol eshek (donkey trails). Jackson was wavering when Ayelen, thankfully only toying with her bowl of botulism, her hair plastered with two week´s worth of airborne particulate and sticking up at odd angles like an eighties punk just out of bed, played her trump. Jackson looked down at the table sheep ishly and I pushed the bacteria around my plate uneasily as she laid into him at length for wrecking her honeymoon. I hadn´t agreed with her that this was going to be a winning argument but perhaps it was after all, for at this point Jackson folded. He has now granted us permission to follow our chosen route through the foothills of the Kunlun Shan but we still, until just moments ago, couldn´t be certain that he wasn´t simply keeping us sweet while all the time making sure our visa extension would be refused. One of his henchmen was here in Khotan to observe us getting off the bus yesterday and this morning any hopes we had that police and immigration aren´t very good at communicating with one another were dashed when it was immediately clear that the Officer for Foreign Affairs was very much expecting us. But to our surprise we have just been granted another month to play with and rather than the usual five day turn around it´s taken just one. I am flabbergasted, frankly. I was certain our only chance of success lay in having as low a profile as possible where police in the main towns were concerned. The moment we were impounded by police in Khalia and I first heard Jackson´s voice on the phone telling me we must come to Pishan at once and check into a hotel like good tourists, I considered the game all but up. Well somehow it´s not and it´s just as well; we can´t stop now, there´s one very important reason waiting for us 190kms away in Koshtaga. Kashi – the ancient name for Kashgar – is a five year old Bactrian camel and is the most amazing animal I have ever owned. This is not remarkable in itself as in fact she´s the only animal I´ve ever owned. She carries our 80-100kgs of baggage, food and water uncomplainingly over pretty much any terrain and makes no noise as she does so on her cushioned pads. She eats bushes covered in thorns that would put a hole in your welly and picks up her bowl and looks at us when it´s time for the good stuff. She has a third eyelid to eject dust and sand and the most ridiculously thick woolly coat complete with knicker-bockers, beard and a quiff. She loves a good hug in the morning and now makes a peculiar sound to show her appreciation. 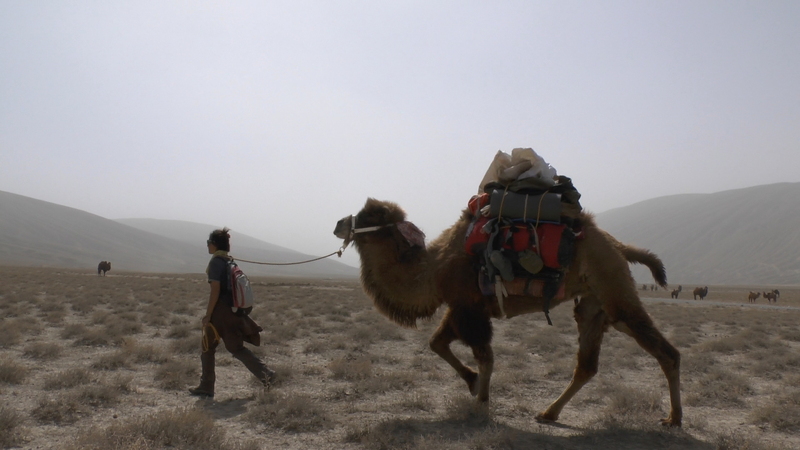 She can be obstinate when faced with an unfamiliar obstacle and has even galloped all the way back down a 1000m hillside, dispensing our kit along the way, apparently on a sudden whim to be with some other camels she´d met at the bottom. Otherwise she is as sweet natured and compliant as we could have wished for. I´ve wanted to travel again with an animal ever since dog-sledding in Greenland and it´s every bit as rewarding an experience again. But part of that reward, of course, comes from the fact that she herself is an extra challenge to be overcome, bringing the weight of responsibility towards a team member whose capabilities, and needs, are still a somewhat grey area to us. We have been in two situations already where a wrong turn has left us at altitude uncomfortably late in the day and the route to the valley floor below is unclear. It´s never been a danger for Ayelen and me for we know we could, if need be, pick our way down the stony slopes. Kashi, though, is no goat and finding the right spur to take her all the way to the bottom and not into some fatal cul-de-sac between impassable ravines has at times caused stress levels to soar. More often than not I find myself worrying about her food, water and general well-being but this is lessening as I become more familiar with her needs and abilities. She is quite simply remarkable and when we are alone with her in some unihabited valley, camped next to a river, dry or otherwise, and happily eating our respective suppers by the fire this trip is almost as I dared imagine it. Even Ayelen, with so much more of a robust attitude to the animal kingdom than I, has found a bond with Kashi. If, along with an end to police harrassment, we can only find a bit of colour to the landscape and some clear air around us we´ll be in an expedition paradise. Clear air has been the driving force behind us trying to head as deep as possible into the Kunlun Shan and not only for our sanity but for our film as well. At the moment every sequence is brown and certain bits of the camera packed up on day one. We had a taste of what might be on the drive from the Kyrgyz border to Kashgar weeks ago: outrageously beautiful ochre valleys topped by snow-capped peaks and dotted with the adobe winter homesteads of the Uighurs. 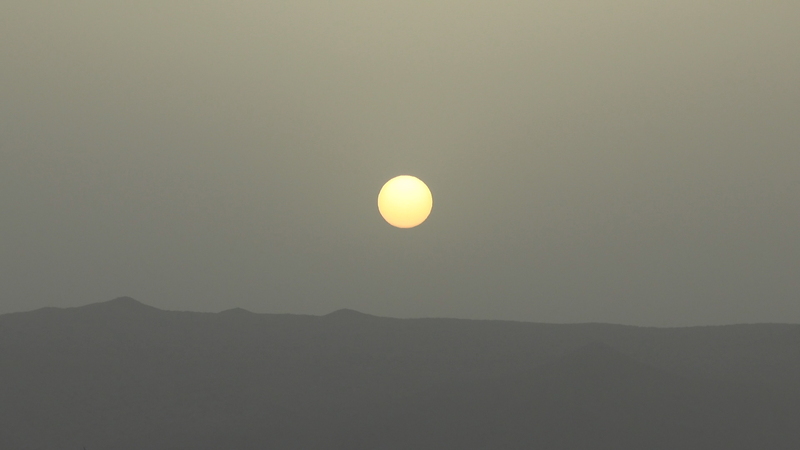 But we were still at around 2000m when we drove into the wall of dust. I couldn´t take any photographs as it was a military zone for 140kms and we sped through without stopping. Still, we thought that altitude must surely be our saviour here also. It took us four days to walk from Yarkand to the start of the hills we knew lay to the south and almost from the start we were potentially in trouble. When the poplar-lined, powdery lanes of the oasis eventually petered out on day two there was nothing but a flat stony desert ahead, stretching into the earthy murk. Here we blundered past indechipherable red signs straight into a military zone. I had thought the distant machines sprouting vast clouds of dust were earth-movers until Ayelen exclaimed, “Look! Isn´t that a tank?” Almost simultaneously there was a rattle of machine gun fire from just ahead and we executed a neat ´About turn!´. Later, amidst more habitation, we began to learn of the intricacies of getting a camel along the banks of an oasis lined river, across the inummerable irrigation ditches and between the arrow straight poplar trunks spaced as little as 50cms apart. Our second experience of locals just calling the cops on us led to a slap up lunch of pilau, albeit eaten alone and outside in the dirt while every one of our hosts retired inside the police station to eat theirs. The law against entertaining foreigners mustn’t be broken! Further south Ayelen jumped on a bus to get to a market up ahead because Kashi and I were taking too long to cover the miles and in her absence I was hi-jacked by a wedding. They put me in a corner of the kitchen and made me eat a bucketful of rice while all the guests filed in to stare. 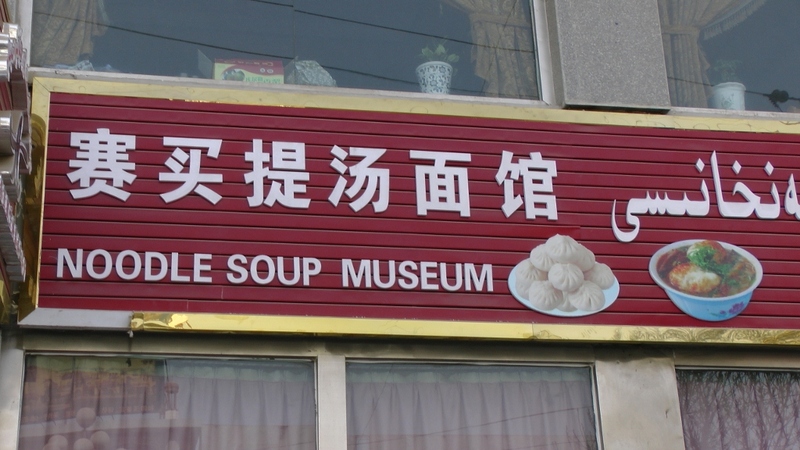 I knew the southern branch of the ancient Silk Road is by far the least visited these days. A guide book in the hostel we stayed at in Kashgar stated that to travel here is to enter the Uighur heartland. It was talking only about jumping between the larger towns along the main arterial road that skirts the Taklamakan but I still wasn´t really expecting the reception we have had in these wayside towns. Everyone has a TV now so it´s not as if they haven´t seen our like before but what in the name of Allah are we doing here?? And it´s a not a bad question. Loving the camel description. What a thing to do.